60K will do this to a man. Throughout my seven-year running “career,” as I’ve clocked off seven New York City marathons in early November and two Brooklyn marathons mid-way through the month, I’ve noticed lurking within the race schedule a little jaunt once called the Knickerbocker 60K and now known more simply, if less entertainingly, as the NYRR 60K. The race, put on by the New York Road Runners (NYRR), consists of a brief 1.2-mile out-and-back along the East Drive of Central Park starting from 90th Street and 5th Avenue followed by nine, four-mile, clockwise inner loops of the Park from the 72nd Street Transverse to the 102nd. During this time, no matter how much I tried to ignore this race, it kept on sashaying into my consciousness each autumn. I found myself wondering what it would be like to run 37.2 miles, and in a circle no less. If I was going to venture into the unknown territory of ultramarathons, ran my fevered brain, the NYRR 60K held a lot of advantages. It was conveniently and cheaply gotten to by subway from my home in Brooklyn; it had a simple bag drop and easy access to medical care in case of emergencies; I knew the course (! ); and I might be able to prevail upon my friends in the South Brooklyn Running Club (SBRC) to join me in a loop or three. So I signed up. I’d already acquired my Boston-Qualifying (BQ) time at the Chicago Marathon on October 12th; I’d run New York as a training run on November 2nd. It was now 13 days later, and I’d recuperated and was ready. Now I just had to show up. The temps on Saturday November 15th were barely above freezing as Francis (an SBRC colleague who was running the race as well) and I met at Borough Hall and took a number 5 to arrive at the NYRR HQ on 89th Street and 5th to pick up the bibs and clear plastic bags for our food supplies. I’d brought some bars and GUs as well as a packet of salt to keep my sodium levels up. We walked over to the start, used the portapotties, dropped our clothing bags at the bag check and our food bags near the food table, and chatted to a few experts and newbies like us. Thankfully, unlike the gusty NYC Marathon, there was virtually no wind that morning, and it was shaping up to become a beautifully sunny, if frigid, day. I was chatting with Francis when I suddenly heard the horn, and we were off. No fuss, no hoopla, just a kind of giddy amazement that we were all about to run 37 miles in a circle—and no walls of any Biblical city would be disturbed by our efforts. My aim beforehand had been to try to keep a 9:30 pace and come in at around 5:52, with a bit of lag for bio breaks. As it turned out, I set out fairly conservatively, and began to tire on the 6th and 7th loops. My time wasn’t helped by a couple of portapotty encounters and a knockdown battle to open my salt packet (which I won). I crossed the finish line in 101st place (out of 300) in 6:05:58, which is a per-mile pace of 9:51. But that’s not the real story. In fact, for all my hopes before the race about getting in under six hours, I’m not that bothered about my time. This, I understand, is a common experience for ultramarathoners. The distances are so absurd and the number of people engaged in these kinds of activities so few in number, that a loop-y ((literally, in this case) brother- and sisterhood is formed. That I was lapped at least twice by at least three people became, instead of a humiliation, a marker of the inevitability of completion. We kept on seeing the same course marshals (and they us), and their extraordinary enthusiasm amid the russets, ochers, and mustard yellows of the trees beneath a cobalt-blue sky endowed the day with more color than it had any obligation to display. The other signature appeal of the experience was the companionship of my colleagues, one or more of whom joined me for all but one of the loops. I suppose some competitors may have had the comfort of a phone or other device to occupy their time playing music and/or listening to podcasts or audiobooks, but another human being beside me made this event special for yours truly. To have my friends Marcus and Ted amuse and inform me for the first five loops and then Dan and Birgit flank me for the final three, and count down 10K . . . 5M . . . 4M . . . 5K . . . 2 . . . 1 . . . before we upped our pace on the final straightaway—well, to be honest, that’s what running is all about. So, what would I counsel for anyone thinking of running the NYRR 60K? Run it with a friend or friends. If nobody will run it with you, ask a friend or two to cheer you on (as I was lucky enough to have with Hannah, Matt, and Caitlin). The runners assembled covered the gamut of body types, age, and ethnicities. As long as you’ve completed a marathon, you should be able to finish 60K. And I’m a pasty-faced, middle-aged, vegan Englishman with bad running form. NYRR wants to ensure you do not die, since that would place a damper on proceedings. There’s lots of food—bananas, GUs, salty bagel halves, and other stuff—at the main table you’ll pass every four miles, and gatorade and water at that station and its sister-stop mid-way between. I brought too much of my own food to eat. In the end, it was the bananas and salt that kept me going. But . . .
. . . don’t stop eating and drinking. Yes, you may need to use the portapotties and your hands may get sticky from banana peel, but I didn’t cramp and that’s good. I was advised to walk through the water-stations and make sure I got a good amount of fluid. That was good advice. I did. I started off slow and got slower, but finished pretty strong. Francis went out fairly fast and had a wretched final 12. I was probably too conservative; he was too ambitious. I’ll leave it to you to determine your race strategy; but know your limits, and pace yourself properly. I can’t say that a 37.2-mile road race is a quintessentially different bodily experience from a marathon. It’s just longer. You have to be patient and relax. Enjoy the sights, smile, and have great (and preferably loquacious) company. It was just a little too cold for full comfort (hat, two shirts, gloves, and leggings). Ten more degrees would make it delightful. But the Park is in its autumn beauty at this time of year. It’s also full of random people cheering you on and wishing you well and joining in the conspiracy: You all know that what you’re doing is kinda goofy, so embrace the improbable and enjoy it. 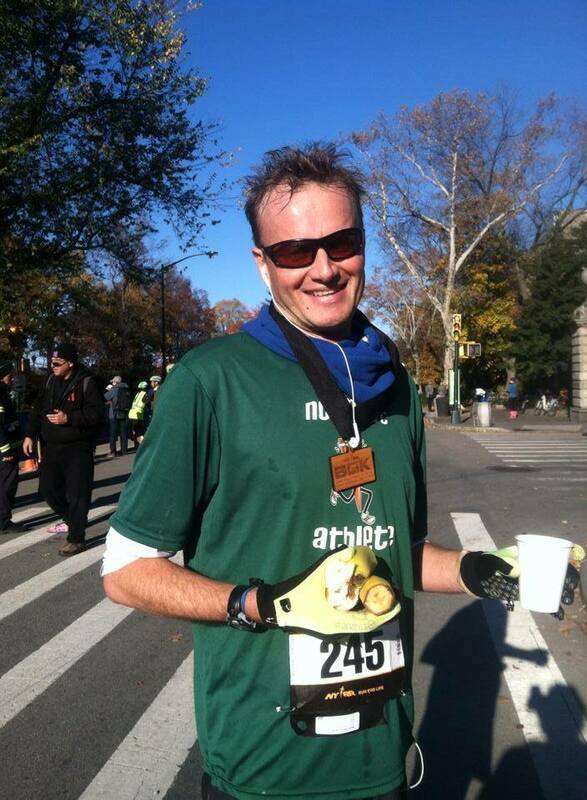 This entry was posted in Running and tagged Marathons, NYRR, South Brooklyn Running Club. Bookmark the permalink.